There's a great raw food eatery in the French Market in Chicago called Raw. After putting my stomach through the grinder after Mexico City, I went through a week or so of eating or drinking liquids. I avoided solid foods like the plague. For about a week, I survived on juices and smoothies from Raw, all of which are super tasty and good for you. It didn't take long for my stomach to recover and my memory to fade, before I was back to my normal eating habits. I did however, want to try their raw sweets selection. A friend of mine happened to be on a vegetarian diet around the same time, so I brought over a lemon square and tiramisu for us to try from Raw. I have to say I was pretty darn impressed. I love Larabars now, but when I was first introduced to them, my friend would rave about how their "apple pie" really tasted like the real thing. I tried countless flavors and all I could think was ... everything tastes the same ... it basically tastes like dates and nuts. I'd rather you just tell me it's a date and nut bar rather than mask it as something else. So I've never really trusted raw desserts to taste like their equivalents. But I have to say that their lemon bar and tiramisu looked and tasted like the real thing, just a bit more dense than what you would expect. I have a basic understanding that all raw sweets are composed of a mixture of nuts, nut butters, dates, dried fruit or cocoa powder. Because it's so nut and dried fruit based, it can be quite rich tasting, which makes it all the more satisfying. I never thought I'd be one to like raw anything ... but her sweets made a believer out of me. 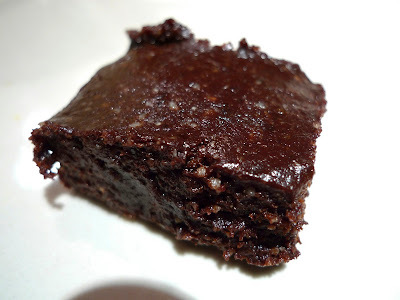 So inspired by my new found interest in raw sweets, I decided to try to make raw brownies at home. 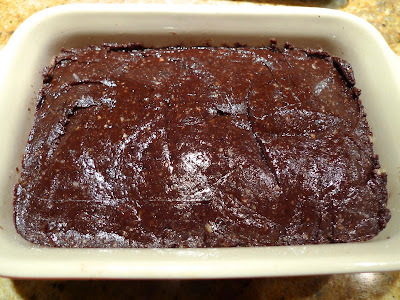 I found a recipe on Jenny Cornbleet's Raw Food Made Easy website and got to making. I have to say this was one of the easiest, fastest dessert recipes I've tried in a while. I think between the three of us, it took all of 3 minutes to measure out the ingredients and mix it in a food processor. Place the walnuts in a food processor fitted with the S-blade and process until coarsely chopped. Remove 1/4 cup of the walnuts and set aside. Add the salt to the remaining walnuts and process until finely ground. Add the dates and process until the mixture begins to stick together. Add the cocoa powder and vanilla and process until evenly distributed. Add the water, dried cherries, and reserved walnuts, and process briefly, just to mix. Pack the mixture firmly into a square container. Stored in a sealed container, Brownies will keep for up to one week in the refrigerator or one month in the freezer. How did they taste? Like a Larabar ... but it was chocolately and chewy. I'm not sure how caloric this is, but there's no butter or eggs in this brownie mix, so it's definitely vegan and raw. Susan decided to trick her nieces and nephews and gave them a piece of this brownie to try. They promptly spit it out. lol. So clearly not a winner in everyone's book, but I thought it was great. You've made brownies with black beans in it? Like pat? That might be kind of interesting actually. haha no i've never made them. but i saw a recipe for it and thought whoah... beans for brownies? i may try it one day since i'm on weight watchers now. Oooh let me know how that turns out. I'd definitely try it.